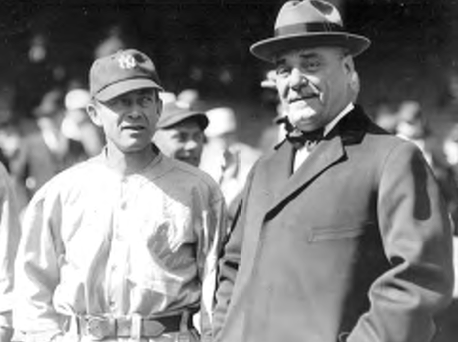 Jacob Ruppert believed that hiring Miller Huggins as his manager after the 1917 season was the first and most important step in turning the Yankees from also-rans into champions. Under Ruppert’s ownership and Huggins’s leadership, the Yankees would dominate the decade of the 1920s, winning six pennants and three World Series. Huggins, a no-nonsense Midwesterner, had little interest in what others thought of him, and certainly not what they thought of his appearance. He had no extravagances. His greatest joy came from fishing, smoking his pipe, and golf, which he started playing late in life. Ruppert, especially as a younger man, was a partygoer and a member of many social clubs. As a congressman, he was a regular at White House receptions, held by his fellow New Yorker Teddy Roosevelt. Home in New York, he would often dine in one of the city’s better restaurants, like Delmonico’s, and then spend the evening socializing at the Lambs Club, the New York Athletic Club, or one of the several German societies to which he belonged. Huggins’s typical evening was spent at home with his sister, Myrtle, with whom he lived. And the only time he may have been seen in a car that was going too fast, it would have been as a passenger. He would sometimes ride along with Babe Ruth, another fast and risky driver. Yet, in the more important matter of building winning baseball teams, Ruppert and Huggins were surprisingly alike. Huggins was less the obedient son. “The head of our family,” recalled his sister Myrtle, “was a strict Methodist who abhorred frivolity and listed baseball as such, especially baseball played on Sunday.”8 Huggins became a ball player in spite of his father’s wishes, usually under an assumed name when he began playing as a semiprofessional. And on those evenings spent at home with Myrtle, he would sometimes have a glass of wine, something which his father would have frowned on. It was much the same with Ruppert: He was a “regal mystery” said one reporter. “There was about him a reserve that made such a [close] relationship difficult.”10 The Colonel “was not one to pal around with the boys,” Rud Rennie wrote in the New York Herald-Tribune. “For the most part, he was aloof and brusque.”11 Even his fellow owners found him distant. 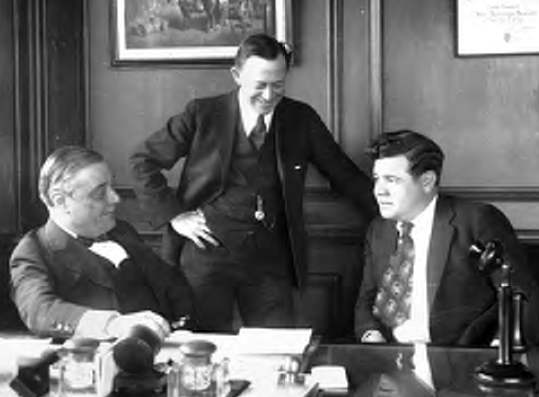 Ed Barrow, seen at right with Ruppert (left) and Huggins, Barrow was a Yankees front office fixture from 1921 to 1945. As an older man, he became close to Helen Weyant, a woman who became the informal hostess at his upstate mansion. She was much younger than Ruppert, and there is no evidence of a romantic relationship between them, or between Ruppert and any woman. He was more like a kindly old uncle; so kindly, he left Weyant a third of his estate. 7. Having control of their “business” was key to both men. To the extent possible, they wanted to control their own destinies. Ruppert couldn’t coexist with his partner, Til Huston. Ed Barrow described them as “two self-willed personalities, who by background, manner, and outlook were worlds apart.”21 Likewise, Huggins couldn’t coexist with Branch Rickey. When Rickey became his boss in St. Louis, after the 1917 season, he knew all personnel decisions would be made by Rickey and left the Cardinals for the Yankees. 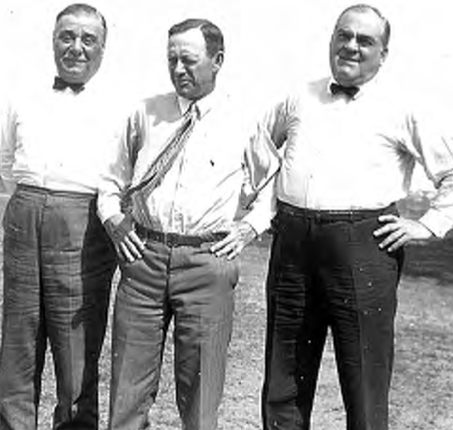 Babe Ruth, right, battled fiercely with Ruppert and Huggins over the years. 9. Dealing with Babe Ruth’s often childish and outrageous behavior caused trials and tribulations for both, particularly Huggins. Eventually, they each would have to confront the Babe, and each would come out on top. Ruth had repeatedly ignored his manager and violated club rules for years. In 1925, with the Yankees and the Babe in deep slumps (they were 27 games out of first place, and he was batting .266), Huggins decided it was a good time for him to crack down. With Ruppert’s backing, he suspended Ruth for two weeks and fined him $5,000. The following season, Ruth and the Yankees made stunning comebacks. The Babe led the New Yorkers to the first of three consecutive pennants, leading the league in runs, runs batted in, and the first of six consecutive home run crowns. Despite the headaches he gave them, Ruppert and Huggins benefited greatly from having Ruth on their team. He not only led them to success on the field, his popularity had helped them take away a good portion of New York’s fans from John McGraw’s Giants. Despite cries from around the league to break up the Yankees, both men recognized the difficulties of staying on top. Ruppert’s response to the other owners was to build up their teams, not tear down his. He compared running the team to keeping his brewery on top, where if a part or a machine broke down, he replaced it. Prohibition robbed Ruppert of his primary source of income with the brewery. And he had to take on (and take down) the president of his league, Ban Johnson, and then his co-owner, Til Huston. Huggins once said, “I fell in love.... The object of my love, though, was no lady. It was baseball.”45 He had little outside of baseball in his life. On off days during the season, he would often go to the Yankees’ offices downtown. “Baseball is my life. I’d be lost without it. Maybe, as you say, it will get me some day—but as long as I die in harness, I’ll be happy.”46 And of course it did get him, and he did die in harness. 17. Moreover, Ruppert and Huggins were fiercely loyal to and trusting of one another. After the 1922 World Series, the Yankees’ second consecutive Series loss to the Giants, the press again was calling for Ruppert to replace Huggins. But the colonel remained steadfast; he re-signed Huggins and said, “Maybe these people who are firing him and hiring others know more about it than I do. ... This talk is ridiculous. We are for Huggins, first, last and all the time.”59 A year later, Huggins rewarded him with the Yankees’ first world championship. 18. Additionally, both men were visionaries. Ruppert saw the potential of Sunday baseball, building Yankee Stadium, and building up the farm system, but he was by no means perfect: he lagged in the areas of integration, night baseball, and the radio broadcasts of games. Huggins, who had been a quintessential deadball-type player, foresaw the coming of the longball era and urged Ruppert to acquire Ruth. Rupert and Huggins would have one more thing in common: perhaps fittingly, both would be long overlooked for formal recognition, which in baseball means election to the Hall of Fame. Huggins did not reach Cooperstown until 1964 and Ruppert not until 2013. STEVE STEINBERG and LYLE SPATZ are the co-authors of "The Colonel and Hug: The Partnership that Transformed the New York Yankees," the stories of Jacob Ruppert and Miller Huggins and how, a century ago, they laid the foundation for the future Yankees’ greatness. Steve’s and Lyle’s previous collaboration, "1921: The Yankees, the Giants, and the Battle for Baseball Supremacy in New York," was awarded the 2011 Seymour Medal. Steve has also written "Baseball in St. Louis, 1900–1925" and many articles revolving around early twentieth-century baseball, including a dozen for SABR publications. He has been a regular presenter at SABR national conventions. Lyle has recently published "Willie Keeler: From the Playgrounds of Brooklyn to the Hall of Fame." He has also written biographies of Bill Dahlen and Dixie Walker, among other books, and has edited books on the 1947 Brooklyn Dodgers and the 1947 New York Yankees. 1. Damon Runyon, New York American, December 27, 1924.
of the Game (Westport, CT: Meckler Publishing, 1991), 41. 3. Jack B. Moore, Joe DiMaggio: A Bio-Bibliography (Westport, CT: Greenwood Press, 1986), 37. 4. Spink’s account appeared years later in “Looping the Loops,” Sporting News, October 21, 1943. Spink was not present at the meeting but probably received firsthand accounts from both Ruppert and Huggins. 5. “O.H.P. Belmont, Too Speedy, Arrested,” New York Herald, March 26, 1902. 6. “John Gernon Killed Racing Mr. Ruppert,” New York Herald, June 29, 1912. 7. J.G. Taylor Spink, “Three and One,” The Sporting News, August 19, 1937. 8. Myrtle Huggins, as told to John B. Kennedy, "Mighty Midget.” Collier’s, May 24, 1930, 18. Years later, James Huggins became reconciled to his son’s playing baseball and even bragged that the skill he showed was hereditary. Henry F. Pringle, “A Small Package,” New Yorker, October 8, 1927, 25. 9. Shortstop, “Huggins Fails to Snare Popularity,” New York Sun, June 15, 1919. 10. Frank Graham, The New York Yankees (New York: G. P. Putnam’s Sons, 1948), 248. 11. Richard Tofel, A Legend in the Making: The New York Yankees in 1939 (Chicago: Ivan R, Dee, 2003), 8. 12. Hyatt Daab, “Timely News and Views in the World of Sport,” New York Evening Telegram, October 26, 1920. 13. Editorial, Baseball Magazine, March 1934, 434. 14. Damon Runyon, “Between You and Me,” New York American, September 27, 1929. 15. “New Owners of Yanks Recover Enough to Talk,” Chicago Daily Tribune, January 22, 1939. 16. Dan Daniel, “Late Chief’s Policies to Govern New Yank Pilot,” New York Evening Telegram, September 27, 1929. Daniel revealed these comments only after Huggins’s death. 17. Fred Lieb, Baseball as I Have Known It (Lincoln: Bison Books, 1996), 228. 18. Betty Kirk, “Jacob Ruppert, ‘Born Bachelor,’ Sees Day Coming with Marriage Extinct,” New York Evening Telegram, June 13, 1928. 19. Frank F. O’Neill, “Loud Wails in Wake of Yank Deal,” New York Evening Journal, January 6, 1928. 20. Will Wedge, “Business Instinct in Baseball,” New York Sun, April 17, 1926. 21. Edward G. Barrow, with James M. Kahn, My Fifty Years in Baseball (New York: Cowan-McCann, 1951), 123. 22. Former Yankees pitcher Bob Shawkey was Huggins’s immediate successor, but Ruppert replaced him after one season. 23. “Hug May Capture Pennant, but not in 1915—Says McGraw,” St. Louis Post-Dispatch, June 23, 1915. 24. Dan Daniel, “Ruppert Sees Boom Year and Pennant for Yanks,” New York Evening Telegram, undated article in Jacob Ruppert file, National Baseball Hall of Fame Library and Archives. 25. Sid Mercer, “Whole City Busy with ‘Dope,’” New York Evening Journal, October 3, 1921. 26. Miller Huggins, “Serial Story of his Baseball Career: Getting New York Angle Huggins’ Biggest Problem at Start of Managership,” Chapter 50, San Francisco Chronicle, March 11, 1924. 27. Joseph Gordon, “Yankee Pilot Waxes Furious at Accusation,” New York American, December 16, 1927.
with Col. Jacob Ruppert,” Baseball Magazine, June 1918, 253. 29. Rud Rennie, “Stop Squawking!” Collier’s, March 4, 1939, 11. Cincinnati Times-Star, April 30, 1906. 31. Miller Huggins, The Sporting News, August 4, 1927. 32. Frank F. O’Neill, “Loud Wails in Wake of Yank Deal,” New York Evening Journal, January 6, 1928. 33. Frederick G. Lieb, “Ruppert Praises Word of Huggins,” New York Evening Telegram, September 21, 1923. 34. Rud Rennie, “Stop Squawking!” 61. 35. W. O. McGeehan, “Down the Line,” New York Herald Tribune, March 11, 1925. 36. Frank F. O’Neill, “Loud Wails in Wake of Yank Deal,” New York Evening Journal, January 6, 1928. 37. Walter Trumbull, “The Listening Post,” New York Evening Post, December 13, 1927. 38. Joe Vila, “Setting the Pace,” New York Sun, December 26, 1928. 39. Editorial, The Sporting News, October 26, 1922. 40. J.G. Taylor Spink, “Three and One,” The Sporting News, August 19, 1937. 41. Jacob Ruppert, “Building a Winning Club in New York,” 254. 42. “Ruth Bought by New York Americans for $125,000, Highest Price in Baseball’s Annals,” New York Times, January 6, 1920. 43. W. O. McGeehan, “Ruppert Lives to Learn Baseball Men Have Class,” The Sporting News, December 27, 1923. 44. Damon Runyon, “Deserved Tribute to Colonel Ruppert,” The 1924 Reach Official American League Guide, 243. 45. Miller Huggins, “How I Got that Way,” New York Evening Post, October 2, 1926. 46. Ford Frick, “Huggins Born 49 Years Ago, Starred with Cardinals,” New York Evening Journal, September 25, 1929. 47. Christy Walsh, South Bend [Indiana] News-Times, September 1929, exact date not known. 48. Warren Brown, “So They Tell Me,” Chicago Herald and Examiner, September 27, 1929. 49. Sid Mercer, “The Colonel,” New York Journal-American, January 17, 1939. 50. Miller Huggins, “Huggins Wins his Sixth Flag,” New York Sun, September 29, 1928. Future Major League stars on the Fleischmann Mountaineers team included Doc White and Red Dooin. 51. Fred Lieb, The St. Louis Cardinals (New York: G. P. Putnam’s Sons, 1948), 69. 52. J. G. Taylor Spink, “Three and One,” The Sporting News, August 19, 1937. 53. William L. Chenery, “Foul Ball!” New York Times, October 3, 1920. 54. Damon Runyon, “Runyon Says,” New York American, December 27, 1924. 55. “Ruppert Happy, Though Smile Cost $200,000 in Receipts,” New York Times, October 9, 1927. 56. Cincinnati Commercial Tribune, “Huggins Got $1,000 of Purchase Money,” March 8, 1904. 57. George Perry, “Three and One: Looking Them Over with J. G. Taylor Spink,” The Sporting News, March 2, 1939. 58. “The Change Huggins Makes,” The Sporting News, November 1, 1917. Owner,” New York Herald Tribune, October 10, 1922. The Sporting News, July 2, 1925. 61. Frederick G. Lieb, “Huggins Will Stay with Yanks Indefinitely; No Longer has Any Thought of Retiring,” New York Telegram and Evening Mail, December 26, 1924. 62. Jacob Ruppert, “The Ten Million Dollar Toy.” Saturday Evening Post, March 28, 1931, 18. 63. Warren Brown, “All in a Week,” Chicago Herald and Examiner, January 15, 1939. 64. Sid Mercer, “The Colonel: Victory Always his Aim,” New York Journal-American, January 20, 1939. Baseball Magazine, August 1923, 398.